Our modern facility includes showroom, warehouse and fabrication shop. Our own highly trained personnel template, fabricate and install the work. The use of Auto-cad allows our engineering department to properly design projects. Check out both our residential and commercial projects we have done in the past. Phillipsburg Marble Company (PMC) is the Lehigh Valley’s oldest fabricator of dimensional stone. 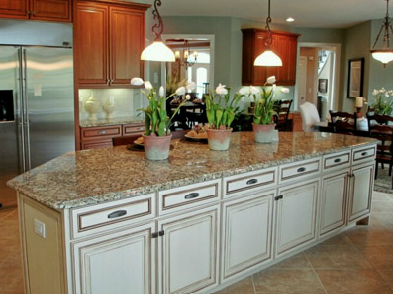 Dimensional stone is natural stone that is cut, shaped, polished and installed utilizing slabs of granite, limestone, marble and a host of other natural materials quarried from around the world. The company as it exists today has been in operation since 1964. The location has a long history of stone work beginning in the 1880’s as a quarry that mined a stone known as Royal Jersey Green, a light green jade like serpentine marble. This stone was quarried in blocks, ground to marble chips used in Terrazzo flooring and ground to talcum powder. A local example of the stone quarried can be found inside the Easton Post Office located on the Corner of 2nd and Ferry Street, Easton, PA. The quarry became depleted in the early 1970’s.